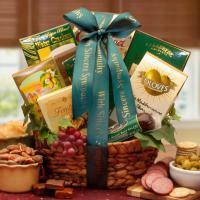 A sympathy gift basket can be a great comfort to brokenhearted friends and loved ones. Unique sympathy gift baskets go a long way during their time of sadness and can be filled with a variety of comforting food and sympathy gifts. 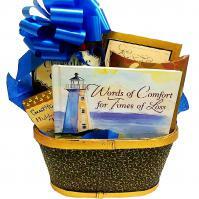 Adorable Gift Baskets offers gift baskets with inspirational books of comforting words, Bible verses, or poems. A number of our popular sympathy baskets contain gourmet comfort foods such as cookies, coffee, cashews, bon bons, pistachios, crackers, cheese, and other delightful treats. Many of our sympathy baskets feature fresh delicious fruit, cheese and nuts or fresh fruit with a flower or flowering plant. We also design chocolate baskets and sympathy baskets featuring keepsakes to cheer your loved one. At Adorable Gift Baskets, each sympathy basket is beautifully decorated with ribbons, bows, and other decorative packaging with a variety of colors and basket designs. 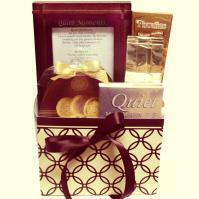 Your loved one might also appreciate a Quiet Moments Gift Mug or a relaxing aromatherapy gift basket. If you own a company, you can have sympathy gift baskets delivered to employees or clients that have recently lost a loved one. Sympathy gift baskets are also fitting for a grieving mother that has recently lost her baby through a miscarriage. You can have sympathy baskets delivered directly to your distant loved ones when a death occurs. Sympathy gifts by Adorable Gift Baskets enable you to express your condolences with quality products and foods at a moment's notice. With our affordable pricing and special shipping offers on select baskets, you can quickly shop online for the sympathy basket that best fits the needs of your loved one. Adorable Gift Baskets specializes in sympathy gift baskets and comforting gifts for brokenhearted, grieving families. Fresh fruit basket delivery, delicious gourmet food baskets, thoughtful gifts and presents delivered. Large sympathy gift baskets can provide easy snacks for visiting family members and their children during a time when your loved one is unable to entertain guests. 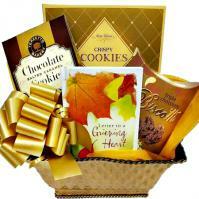 Sympathy gift baskets, beautifully presented and visually uplifting, touch the heart as no other gift can do. During times of grief, there are no words to say. 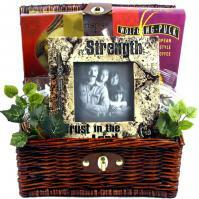 Let a beautiful sympathy gift basket deliver your heartfelt message. We provide a simple way for you to have sympathy gift baskets delivered to a loved one's home to demonstrate your love and sympathy during their time of loss.